The sculpture was crafted by Sakatah Carvers. 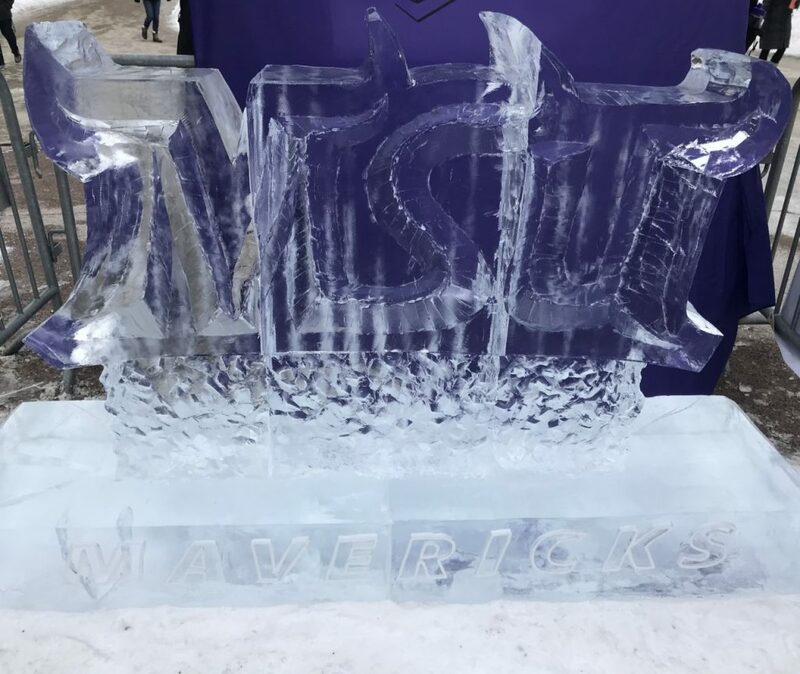 As students braved the cold, the chill was ideal for the new “MSU MAVERICKS” ice sculpture that will rest in the CSU Mall for the remainder of the week. The carving commissioned by the Student Events Team is the work of Waseca-based Sakatah Carvers comprised of the creative duo, Adam Scholljegerdes and Joe Christenson. The craving duo have won numerous awards and hosted the Kiwanis Holiday Lights carving competition. For more info, visit sakatahcarvers.com. Warming the winter, the Student Events team also hosted an outdoor station offering s’mores, hot chocolate, free cookies and selfies with the sculpture. “This was a great event to help build school spirit. Bringing in the ice sculpture is starting to become a tradition. Last year the sculpture was Stomper (the school mascot) and this year it is the MSU letters,” Brandon Weideman, Student Events Team Spirit & Traditions Chair, said. This is the third time an ice carving has been hosted by the Students Events Team and the team hopes it will make students feel welcomed back and helps get them ready for a new semester. “We found out last year students were really inspired by the Stomper Ice Sculpture. It brought them a sense of joy in the middle of the doldrums of February. It was the most snapped location in Mankato for two days straight,” Weideman said. Being able to see this sculpture should help raise students’ spirits around campus on these cold winter days and hopefully inspire students as they take on Spring semester at MSU.